I believe that that we cannot achieve world peace until we, as a world, grieve the bombing of Nagasaki. This group of paintings is dedicated to bring awareness about nuclear destruction and to convey a message of peace and healing between the nations of Japan and the United States of America. As a child, I knew about Japan from my father who was stationed there after World War II. He brought back exquisite art objects and spoke with great respect and admiration of the Japanese people and culture. He always wanted to return to Japan with my mother and me. When I was in high school I learned about the atomic bombs my country dropped on Japan. I felt tremendous sadness and shame about the suffering of the innocent people of Nagasaki and Hiroshima. I hoped someday I would be able to express my sorrow and to extend a gesture of peace to the people Japan. As a young artist living in New York City in the 1970’s, I became increasingly interested in Japanese culture and religion. I studied Zen Buddhism, Chanoyu, and sumi-e painting. In the 1980’s I moved to rural New Mexico, near Los Alamos National Laboratory, where the atomic bombs were built in the 1940’s. 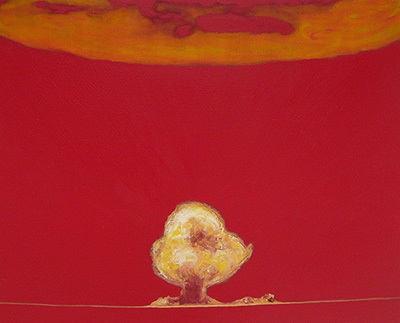 In 1985, I painted Rings of Saturn, my first work of art addressing nuclear destruction. Over the past two decades, I have created a series of abstract paintings entitled Nagasaki: Eternal Peace. Some of these works are images of healing and hope, while others are depictions of death and destruction. I hope that the colors and brushwork in my paintings can speak in a visual language of peace to people of all nations.